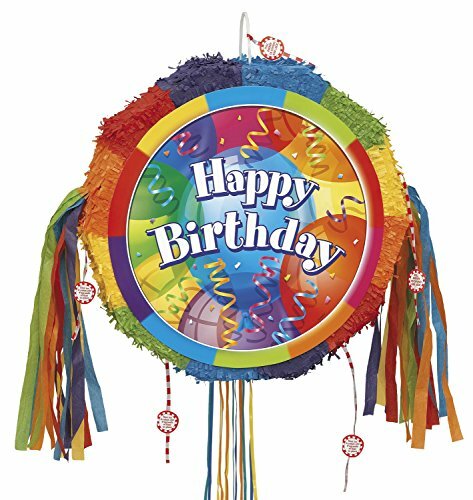 Our Brilliant Birthday Pinata, featuring a vibrant array of balloons, confetti and streamers, will turn your birthday celebration into a colorful event! A new twist on an old classic, this Pull String Pinata has guests take turns pulling 1 of 12 strings to see which one releases the goodies. Simply fill the Brilliant Birthday Pinata with up to 2 lbs. of candy and favors (sold separately) and let the fun begin. The Brilliant Birthday Pinata doubles as both a brightly colored decoration and as everyone’s favorite party activity. Contains one 18″ x 19″ Brilliant Birthday Pinata.